Whether beginning a career emphasis or advancing their career information, students need a simple, real-life view of the type of work employees in different jobs encounter each day. Learning about Careers offers students the role of employee in 32 targeted careers where they practice blending academic and work readiness skills while completing typical job tasks. Learning about Careers provides 32 lessons in 16 career clusters. Each lesson includes a career overview where students identify the skills, knowledge, and characteristics required to achieve success, a personal budget exercise based on earnings in a specific career field, and additional resources for further exploration. They are ideal for courses in career discovery, career exploration, transition, or any class that can profit from blended academics and work readiness. Lessons can be printed, or stored on individual computers or a school server. 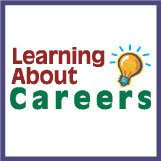 Click here to view additional Learning about Careers description.